LoNoWriMo is local novel writing month, and this is my second in a row. LoNoWriMo is where you sit down at your computer and write a novel in a month, without the fanfare and public suffering of NanoWrimo. To sign up for LoNoWriMo, just open your word processor and start typing. Sales of my Hal Spacejock ebooks really took off in July, partly due to the release of the fifth novel in the series, and partly due to lots of people buying the books. Heh. Hal Junior has been quiet on the ebook front for the past 7 or 8 months, but in July sales are about ten times average. I dropped the price of Hal Junior 1 and 2 to 99 cents for a while, to increase visibility. When Hal Junior 3 comes out, I'll set the first book to free and price the other two at 2.99 or 3.99 each. Some people have asked me whether it's still worth bothering to publish paperbacks, and my answer is 'it depends'. If you're looking to spend big on jacket art and design, interior layout, etc, then you really have to ask yourself how many copies you're likely to sell. (Right now, the Hal Spacejock ebooks are outselling paperbacks by 100 to 1, but despite that I will always offer printed editions of my work.) Another strategy is to test the market with an ebook first, and only go to paper when the ebook income justifies it. It still hurts if you have to spend four months royalty on jacket design, though, which is why I said 'it depends'. So, what's your strategy? Ebook only, ebook and paperback, paperback only or chasing a publishing contract? Dean Wesley Smith just posted an article on Fear in publishing. Whether you're writing for a trade publisher, chasing a publishing deal or looking to self-publish your first novel or short story, it's worth reading. Hal Spacejock 6: Safe Art - I've completed 28,000 words in 24 days. Target 65,000, and I'm hoping to have the first draft done by the end of August. November is Nanowrimo, and this year I intend to write a brand new novel featuring another character from the Hal Spacejock series. It'll be more gritty than the Hal Spacejock books, and it should satisfy my itch to write a proper thriller. It's possible Nanowrimo will delay Hal 6, but not by much. After that I have a half-finished Hal Junior 4 novel waiting to be restarted, and Hal 7 is already 2/3 complete. Deadlines are a bit nebulous this far out, but assuming December '12 to write Jnr 4 and Jan/Feb '13 to write Hal 7, then Jnr 4 could be out in March '13 and Hal 7 could be April/May. On top of that, Albert Aribaud, the translator who did such a good job on the French edition of Hal Spacejock book one, is currently working on the translation of Hal Junior: The Secret Signal. Very preliminary estimates are for a December completion, but that's just a wild guess at this stage. I'll also have more translation news soon. Hal Spacejock really is spreading his wings, isn't he? Obviously these deadlines are subject to change, and they depend very much on how much programming I have to do to pay the bills. My ebook income for the past 6-8 months is the only reason I've been able to write and release more books: I can point to the income and convince my family this writing business isn't just a hobby, and the long hours I spend at the computer really are worth it. This isn't some lame author plea to buy my stuff, it's just a fact of life. For the first time in the past 15-20 years I can afford to devote more than odds and ends of spare time to my writing, and my output has increased enormously. I hope your own projects are coming along - please feel free to comment below, letting me know what you're writing and how much time you're managing to put in every week. You've probably noticed this blog can be a little ... sporadic. Over the years I've blogged about every aspect of the writing process, but after publishing seven or eight novels there's not a whole lot of new stuff I can say about it. ('Put your bum in a chair and start typing' sums it up.) So, during the writing of a novel I don't tend to post to the blog very much. It's only after each novel is complete, when the dust settles, that I look around and make observations on the state of publishing, self-pub, ebooks, and so on. That part is changing all the time, and timely info is useful. For example, five years ago hardly any (non-US) writers had heard of ITINs and EINs, but these useful numbers have become a hot topic over the past year or so. To rewind a sec, when I'm flat out writing I don't write lengthy blog posts. What I do, quite a lot, is post to twitter and my facebook author page. Those are the best places to keep up with me during the writing process. After seven years touring Australia and New Zealand, interstellar freighter pilot Hal Spacejock has finally arrived in France. Fortunately, he missed the Arc de Triomphe and the Louvre, but I'm afraid the Eiffel Tower now resembles the Leaning Tower of Pieces. Mr Spacejock blamed his flight computer, which refused to fly on the left. So what does Hal's visit mean to you, a keen science fiction fan who enjoys fast-moving, humorous novels with space travel, robots, double-crosses and more incompetence than a gathering of Finance ministers? Well, thanks to the hard work of Albert Aribaud, the intrepid hero's first adventure is available right now* in French translation. Marvel at Hal's lack of skill, gasp at the Navcom's bold chess moves, and try not to wince as a 200-tonne spaceship lands in all the wrong places. * Currently available in ebook editions via Amazon Kindle [link up soon] and Smashwords. iTunes, B&N, Kobo and Paperback to follow shortly. Hal Spacejock se pose en France ! Après sept années à parcourir l'Australie et la Nouvelle-Zélande, Hal Spacejock, le pilote de transporteur intergalactique, arrive enfin en France ! Par chance, il a manqué l'Arc de Triomphe et le Louvre, mais en revanche la tour Eiffel va devoir être rebaptisée "tour Fêlée". Monsieur Spacejock en rejette la faute sur son ordinateur de bord qui aurait refusé de voler à gauche. * Actuellement disponible en format électronique sur le Kindle d'Amazon et sur Smashwords [link]. Édition papier à suivre prochainement. 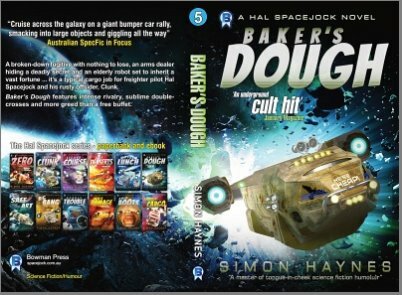 I just posted Chapter Three of Hal Spacejock 5: Baker's Dough to my website. Chapters one and two are available from the same page. The release is due any day now, and I'm releasing a chapters for free until the ebook is published. Well, word of mouth, obviously. But apart from that, do you know what I've found is the most effective, the most sure-fire way to bring your writing to the attention of new readers? This month has seen a 50% bump in my ebook sales, from a fairly healthy daily average. Did I take out adverts, upload a new trailer, run a new competition or spam my my long-suffering twitter and facebook acquaintances? No, I just put the first chapter of my upcoming novel on my website, and mentioned it a couple of times in passing. I also released two new stories and published one reprint. But last month I also managed to write a 30,000 word junior novel, and today I bashed out 2000 words of Hal Spacejock book 6. This is the opening chapter, and I'm so keen to write this book I can hardly wait to finish this blog post and get back to it. Sorry kids, takeway for dinner again ... Dad has a book to write! The good news is that Hal Spacejock 5 will be released later this month (both ebook and print editions). It's been a long process, but I haven't spent the past three and a half years endlessly rewriting the same manuscript. Oh no, it's much more fun than that. I wrote Hal 5 FOUR times, with four different plots (and many other subplots), as well as a huge cast of characters scattered across the various attempts. Do you want to know how many plots and subplots? Would it help if I told you I have Hal Spacejock books 6 through 20 half-written, partially written, outlined and/or plotted? No kidding. THAT many plots and subplots. Disaster plots, secret agent plots, big bad criminal plots, mistaken ID plots ... and others to boot. So, what are some of the other titles I considered for this book? Hal Spacejock 5: How Many Blades of Grass in my Garden? Hal Spacejock 5: Sharpen more pencils!